Military dogs work side by side with servicemen and women. Thanks to Bill H.R. 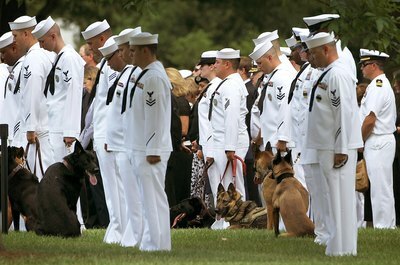 5314, also known as “Robby’s Law,” military dogs are no longer euthanized when their service is complete. Instead, when a four-legged war hero retires, he can be adopted from a military working dog facility by an American family to live out his days in peace. Contact a military working dog facility in your area to submit an application. A list of facilities is available on the Internet or through your local telephone directory. When you contact a facility, let them know you are interested in adopting a retiring dog who is suitable for a civilian home. If a facility isn’t in your area, contact the office of the Military Dog Adoption Program at Lackland Air Force Base to request an application. Provide the names of two personal character references, as well as the name of your veterinarian on the application. You will also have to provide details regarding your home life. For example, do you have a fenced yard? Do you have children or other pets? Answer all questions in their entirety. Be prepared to be placed on a waiting list. At any given time, at least 300 applicants are waiting for a dog to become available. The wait averages 12 to 18 months. Ask questions about your prospective dogs background when he becomes available. It’s important to understand many military dogs have been in combat situations. Some have physical problems associated with injuries suffered from explosions and accidents. Be certain you are up to the personal and financial responsibility of your four-legged warrior. Pick up your new dog at the designated facility. Bring a leash and crate for safe transportation. Adoptions are free but you are responsible for paying travel expenses for you and your dog. Bring two forms of identification, because you will be required to sign a legally binding agreement in front of a notary public promising to provide proper veterinarian care and releasing the Department of Defense from responsibility if any problems arise. The military uses a variety of dog breeds. You may be able to shorten your wait time if you are willing to accept any breed. A military dog is an intelligent, highly trained canine. While you wait for the adoption to go through, prepare yourself by discussing handling techniques with military dog handlers. Some military dogs are aggressive and not suitable to live with small children or other animals. If you do not honor the agreement to care for your military dog properly, you may be prosecuted under federal law. When Does a Havanese Stop Growing? How Should a Dog Behave When Meeting Other Dogs? Why Do Dogs Shake Themselves?